A graduate of Gordon College and the University of Connecticut, Dr. Vought currently teaches history at Ulster County Community College in New York. His specialty in American immigration and ethnic history is ably displayed in this fascinating book. Surveying immigration policy in America since 1790, Vought focuses primarily on the administrations between McKinley in 1897 and FDR in 1933, with a concise look at how policy unfolded in the remainder of the 1930s into the 40s, Vought has imparted a genuinely important and authoritative study to the understanding of immigration. In comparing and contrasting the approaches of each president, we come away with a better grasp of the events that opened immigration and then gradually restricted it through the FDR Era. In devoting each chapter to individual administrations, Vought has dispelled a number of the emotional myths that accompany too many shouting matches in academia and in the culture about immigration now. Republicans are usually designated “isolationist” and “nativist” while Wilson and FDR, in initiating and then maintaining the severe restrictions on new immigrants are not so labeled. Vought exposes the double standard inherent in treating the history of the Progressive period and surveys all the Presidents with an excellent balance and sense of perspective. When we come to chapter 7, “Calvin Coolidge and the Prosperous Melting Pot,” we find one of the best and most accurate introductions to the thirtieth President’s views on immigration in print. Coolidge’s success in one of the most cosmopolitan areas of the country is but one proof against the charge that Cal was nothing more than a narrow-minded provincial. Among his closest friends, as Vought reminds the reader, were immigrants, especially among the Irish. Coolidge was not the bigot Wilson was nor the expedient politician Harding became but rather brought the extensive experience his successor heavily lacked in mitigating, channeling and redirecting the worst parts of the Immigration Act he signed in 1924. Where Coolidge saw all people as children of one God and Father under the law of service and mutual forbearance, Hoover espoused the atomist “rugged individualism” that ultimately denied the equality of the Declaration and led to so many of the unfortunate effects from the “likely to become a public charge” policy initiated by Hoover. It would continue under FDR, closing the door to immigrants from Europe, despite the pleas for asylum reaching acute levels in the late 30s. Coolidge’s clear repudiation of Social Darwinism and the arguments of the eugenics movement are explained and proven even in the midst of his signing the Immigration Act of 1924. 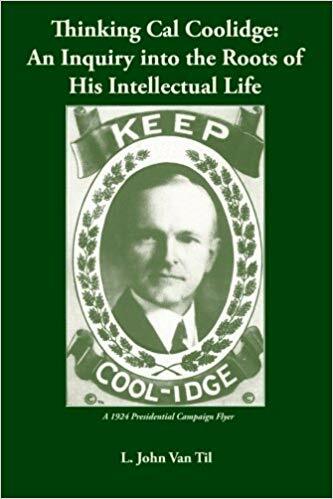 Attaching his firm dissent against the Japanese restriction by Congress, Coolidge stood firmly throughout his tenure for the success of the melting pot to assimilate all who come into the ranks of good citizenship. While retaining Harding’s Secretary of Labor, James J. Davis, the primary proponent of the eugenics case for restriction, Coolidge never embraced the arguments that genetic or racial differences were insurmountable barriers to becoming part of the American experience. Even in defending restriction he did not do so on the basis of these non-essential lines but with his characteristic concern for human well-being, pointing out that unending influx would first hurt the most recent arrivals and contract opportunity for everyone, both native and foreign-born. Coolidge certainly did not countenance the hysteria of war-time propaganda against “hyphenated Americans” any more than he would have implemented its later equivalent: the wholesale internment of the Japanese in the 1940s. He used the bully pulpit to great effect in postponing the national quotas not only once but twice and while the impossible task assigned to his administration by Congress was accomplished with the best attainable outcome, he resisted the efforts to curtail immigration completely, deny asylum outright, or initiate the intelligence tests and other pseudo-scientific notions of the eugenicists, whose credibility along with KKK, Vought notes, were both in swift retreat in the 1920s. Coolidge defended the use of census and naturalization records, rather than the much more arbitrary national origins formulas set to define the law after 1927. By delaying the implementation of the quota system, Coolidge used his authority to postpone the day of reckoning that its unrealistic lines would impose. In addition, Coolidge succeeded in establishing immigration processing at its sources overseas, requiring clearance before the long journey to America was made, thereby alleviating much of the pain and loss to families sent back after so much effort invested to get here. As such, this helped remove much of the force behind the claim that turning people away lacked compassion. Coolidge lost the battle to keep out the Japanese exclusion provision from the Immigration Act but not without prevailing on these other important fronts. 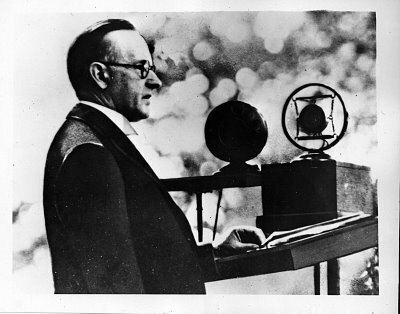 Coolidge’s courageous political risk before the American Legion Convention in Omaha in 1925, is illustrative of the position Coolidge embodied. He believed that what the country needed was just as much the responsibility of the oldest American citizens to help and assist the newest arrivals, each serving the good of the other, as it was necessary for immigrants to embrace America’s ideals and founding principles. All were, nonetheless, capable of self-government. This was no “white man’s” country alone but we are all “in the same boat” now, sharing the same spiritual nature and qualities of soul, Cal would declare more than once. 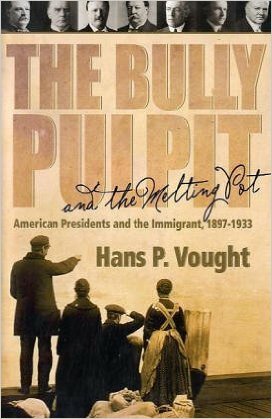 Vought reminds us that for all the differences in particular styles and outlook under each President, the success of the melting pot to bring Americans together survived the attacks it faced by nativists out the 1882 Chinese Exclusion Act and even after joining with eugenicists in the 1910s and 20s. This mistaken coalition would finally meet defeat when their connection to the fascist movements of Europe became evident in the 1930s. Each President, in his own way, perpetuated and revitalized the melting pot vision, no less in the 1920s than in the eras preceding and following it. Vought’s study places each administration in its proper place of importance. The 1920s were not the simplistically “isolationist” years they are portrayed to be by the “historical consensus.” Vought dispels those falsehoods with solid and powerful prose (grounded in meticulous research) without any of the snide derision that usually accompanies descriptions of the Coolidge Era and the 1920s. Vought does not succumb to the trap that befalls too many of accusing the 1920s for what the 1930s wrought in immigration. Vought clearly explains the Coolidge policy and how the virtual end of immigration and asylum took place under Hoover, not before, driven as #31 was by different motivations and different challenges. Coolidge’s role in immigration was not as provincial, exclusionary or destructive as is commonly thought. The Bully Pulpit and the Melting Pot merits a place in the current discourse on immigration, especially with all the emotion that the subject has long engendered. The insights of experience, recalled for us by Vought, need to be examined again not only in tempering the false claims that are hurled whenever restriction is proposed but also in the careful crafting of sound and common sense responses for future policy. Coolidge belongs in the proud tradition of those brave advocates of America’s great melting pot. Coolidge’s balanced approach of gradual assimilation, keeping the door ajar not shut completely, calls for new consideration. His policy grounded in the mutual responsibility to serve and help one another, because of man’s common spiritual nature and equality before God, was not the total exclusion of immigrants as is mistakenly indicated any more than all restriction is inherently bigoted or prejudiced today. Coolidge demonstrated that restriction was about something more than the motives of genetics or ethnicity or even Hoover’s “individualism,” it was about preserving opportunity so that everyone can find opportunity here by gradually absorbing into shared citizenship. It was a practical demonstration of serving and being served, as our common humanity obligated. This citizenship was not about quantity but about quality, not about the cheap labor desired by “Big Business” but about allowing the melting pot time to work as it was designed for the betterment of everyone involved. This was not to make-over America into some convoluted vision of sterility or “sameness,” but Coolidge championed the vibrancy and diversity of backgrounds America’s melting pot had always been. This work had to balance the welfare of those already here without compromising the principles of liberty and law that made the whole structure possible in the first place. By upholding some measure of restriction while keeping the “back doors” of Mexico and Canada open, the immigration policy of the 1920s (lasting as it did for nearly 30 years) would continue to grow opportunity for everyone’s future progress.